As a Radio TV Broadcasting major at San Jose State College, Joe Sharino began performing at local nightclubs as a part time job in 1974 with his friend Don Orason, earning $20 a night each. Then Don left to pursue starting a band, and Joe continued playing as a solo act. He played acoustic guitar and sang mellow folk and pop songs. Within a few months, the act evolved to include uptempo Rock and Roll, impressions and sing alongs. Within a year, there was standing room only, people waiting in lines to get in and the $30 a night had multiplied exponentially. Just one semester from graduating from San Jose State, Joe left college to play music full time figuring that in a few years, he'd be back in school. By 1976, Sharino was filling nightclubs like the Garrett, Mountain Charley's and bigger nightclubs like the Parlor and Fargo's on weeknights and the nightly fees had increased four and five fold. Nightclub owners in Phoenix, Tucson and even Cleveland soon heard of the phenomenon and Joe found himself entertaining out of state. Dooley's, a nightclub in Tempe, Arizona held 1,200 people and there were lines waiting outside to see Sharino each night! The audiences at Bobby McGee's in Cleveland went wild for the music, too. In the next five years, Sharino made two trips to Cleveland and twelve trips to Arizona while still packing clubs in the Bay Area. In 1978, Joe made the act a duo, adding Dave Petrucci on drums. By 1979, the phenomenon was still growing. Joe decided to form a band to broaden his horizons to include being an opening act for major concerts and to open the doors to the casinos of Nevada. Concert openings soon came and the Joe Sharino Band was the opening act for America, David Lindley, B. B. King, Emmy Lou Harris, the O'Jays, Charlie Daniels, Chuck Berry, Alan King, The Drifters, The Temptations and many more! The nightclub popularity continued through the 1980's and Joe found lots of new opportunities as well. He released his first record, "A Thief In The Night" in 1980. Joe sang the national anthem at an Oakland A's baseball game which was televised on NBC. Two weeks of shows at the Sahara Hotel Casino in Lake Tahoe, and a show at the Alladin Casino in Las Vegas soon followed. Joe and the band also performed for a two week engagement at the Sheraton Waikiki in Hawaii in the early 1980's. In 1982, Apple Computer founder and Sharino fan, Steve Wozniak invited Joe and the band to perform at the Us Festival in Southern California. Dubbed the "West Coast Woodstock", it was a three day festival which drew 250,000 people to hear Fleetwood Mac, Tom Petty, The Police, Santana, Pat Benatar, Jackson Browne, The Cars, The Kinks, Eddie Money and yes, The Joe Sharino Band! The band received rave reviews from Time Magazine, Rolling Stone magazine and appeared in national news telecasts on NBC and ABC. The following year (1983) Steve Wozniak invited Joe and keyboardist Joel Nelson to Us Festival 2 to participate in the first "Tele-Jam Session". Live via satellite, Sharino and Nelson (in Southern California) had a "jam session" with the Russian band Arsenal who were playing music with them... in MOSCOW! The show was televised all over Europe and the USSR. In 1984, the Us Festival Movie was released and shown on Showtime including Joe's "Tele-Jam Session". In 1984, thanks to help from Steve Wozniak, Joe released his second record, and MTV video, "I Wanna Be President". Several of the songs received airplay on radio stations in California and Oregon. Also in 1984, Sharino and the band began a tradition that continues each year, The New Years Eve's Eve show at the Cocoanut Grove in Santa Cruz on the day before New Years Eve, December 30th. This show sells out 1000 tickets in advance each year. From the late 1980's and into the 1990's, the focus of the band's shows changed to include corporate events, weddings, fundraisers and outdoor festivals and fairs. By the early 1990's these private functions began to outnumber the public nightclub shows. The band now has a corporate client list that includes nearly every large company in the San Francisco Bay Area and beyond. Joe and the band have traveled to Hawaii, Nevada, Washington, Massachusetts, Arizona, Idaho, Utah, Florida, Ohio, Washington D.C., and New York for corporate events. In addition, Joe started a company called Sharino Productions through which he produces entire events including decorations, lighting, booking entertainment (including nationally known acts), advertising, venue and schedule planning. He also writes and records commercial music including theme songs, jingles and soundtracks. Clients include General Electric, Hewlett Packard, Apple Computer, Cisco Systems, Fujitsu, Quantum, Owens Corning and many more. The Joe Sharino Band was also chosen by the San Francisco Forty Niners to be their "House Band" for the 1997-1998 and 1999-2000 seasons. 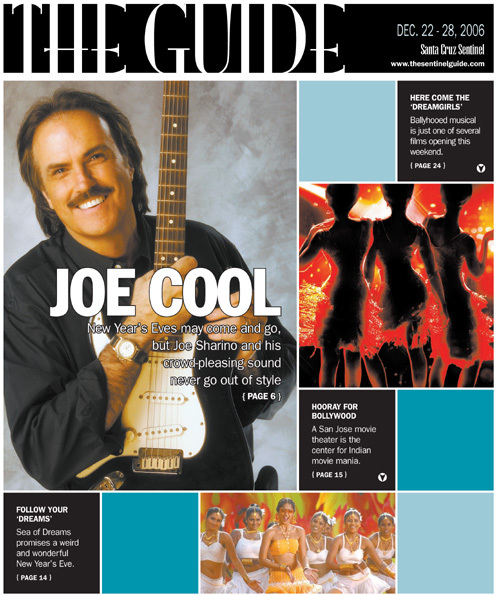 In 2004, Joe added two new configurations of the Joe Sharino Band. Sharino Plus One adds a female vocalist, and The Sharino All Stars is the bigger 'show band' configuration. It adds two female vocalists, plus 2 more horns (alto sax and trumpet) and includes eight performers total. Along the way, the Joe Sharino Band has won 17 Best Band Awards in Northern California from the San Jose Mercury News (4), Metro Magazine (5 awards), Good Times Magazine (6 awards), KGO radio's listener's poll and Accent Magazine. In addition to the two albums mentioned above, Joe also released two tapes of instrumental music in the early 1990's. 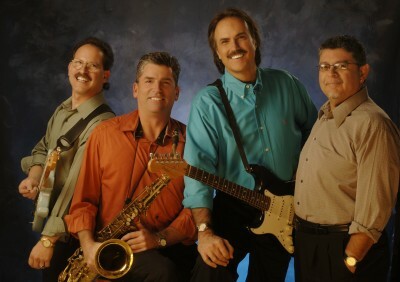 Currently the Joe Sharino Band plays about 50 - 65 shows a year. A lot has changed since 1974, but the fun, the great sound, the sing alongs, the sheer love of the music has always been a big part of every Joe Sharino show. We treasure each of you who have been our faithful supporters over the years! Thanks so much! The members of the Joe Sharino Band are the "cream of the crop" of California musicians. Each is a great lead singer and plays several instruments. Joe Sharino: Lead vocals, lead guitar, keyboards. Andy Morales: Lead vocals, drums, percussion, guitar. Andy is an amazing singer and drummer who has performed with Santana, Sly And The Family Stone, Malo and many other national acts. He is one of the most sought after musicians in Northern California. Mark Belshaw: Lead vocals, saxophone, guitar, keyboards, flute. Mark has toured all over the U.S. and is a great showman. He's known for his searing sax solos which are often played while he's out in the audience, sometimes standing on a table or chair on the dance floor! David Petrucci: Vocals, keyboards, guitar. Joe and David met as teenagers and were in bands together then. After several years of Joe performing solo in the 1970's, David joined him on the drums. When the band was formed, David switched to keyboards and guitar. He has toured all over the U.S. and is a much sought after talent. Jeremiah Jones, Audio Engineer. Many bands have stopped using an Audio Engineer (or a Sound Man) in an effort to cut costs, but The Joe Sharino Band knows the importance of a good sound engineer and has a legendary man in that position, Jeremiah Jones. Jeremiah is a master of mixing live sound and has worked with many of the top bands in Northern California. The Sharino sound is never too loud, in fact people say the sound of the band is so perfect, it sounds like a CD! Jeremiah is also a guitarist, vocalist and videographer. Rob Wolbach: Stage manager/Stage Lighting Operator. Rob is also a veteran of live sound, theatre productions and lighting. He's worked with several prominent bands at hundreds of live concerts and nightclub shows. He is well respected in the industry.